If you have missing teeth and are looking for a reliable solution, Copperstone Dental is pleased to offer SE Calgary Dental Implants to restore your oral health and wellness! Dental implants are used to replace one or more missing teeth by using an artificial root made of titanium metal or ceramic. If you have missing teeth, Dental Implants treatment might be the best solution for your unique needs. We also recommend Dental implants for patients with dentures to maximize the fit and comfort of the denture when problems such as inadequate bone levels are or irregular bone shape interfere with the function of the denture. Patients that experience pain and irritation to their gum tissues, and resort to using denture adhesives are great candidates for implant supported dentures. 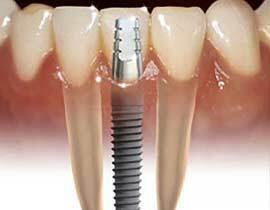 Ideal candidates for dental implant treatment have good overall health and practice routine oral hygiene practices. Adequate bone levels in your jaw are also required to support the dental implant, and healthy gum tissues that are free of gum disease is very important, for your dental implant treatment to be successful.